TODAY IS THE FIRST DAY OF PASSOVER, 2018. And here’s a Passover-worthy cake to bake during the coming week. My Iraqi Granny made the most incredibly light sponge cakes. Just look at this beauty, freshly baked and coming out of the oven. How did she do it? First, she separated the yolks from the whites. With no electric mixer or rotary egg beater, she whipped the whites into billowy clouds in a large platter with a fork (!) and carefully incorporated them into the yolks. Of all the many things Granny baked, it’s her sponge cakes that I remember most. This happened in Shanghai, where my father, mother, brother, and I lived with Granny in a one-room apartment during World War II. I’ve tweaked Granny’s recipe just a bit to include jolts of orange and lemon zest. Mashing or pounding the finely grated zest with some granulated sugar extracts as much of the natural oils as possible, giving the cake its special taste. And here’s another thing I do: I do NOT preheat the oven. I find puff cakes such as sponge and angel food cakes rise much better when put into a cold oven and then the oven is turned on. To make this cake when it’s not Passover, please see the NOTE at the end of the recipe. The matzoh meal must be a fine cake meal. Regular matzoh meal is too coarse and the cake will not rise properly. 1. Have ready a two-piece 10 x 4-inch tube pan, preferably with “feet.” The pan may be plain aluminum or non-stick. Adjust an oven rack to the lower third position but do not turn the oven on. 2. In a medium bowl, whisk together thoroughly—at least 30 seconds—the matzoh cake meal, potato starch, tapioca starch and salt. 3.Remove the zest from the orange and lemon with a microplane. You should have about 2 tablespoons in all. Set aside 1/3 cup of the sugar to whip into the whites. In a small mortar with pestle, mash the zest with 3 tablespoons from the 1 cup sugar until the sugar is infused with the oils from the zest. If you don’t have a mortar and pestle, mash the sugar and zests together in a small bowl with a fork. 4. In a medium bowl, beat the egg yolks on medium speed with a hand-held electric mixer for about 2 minutes until they thicken slightly. Beat in the citrus sugar and salt. While beating on medium speed, gradually add the remainder of the 1 cup sugar, sprinkling it into the yolks in a steady stream. Increase the speed to medium high and beat 3 to 4 minutes more, until the yolks are very thick and pale and form a slowly dissolving ribbon when the beaters are raised. 5. On low speed, beat in the orange juice and then the dry ingredients, beating only until incorporated. Scrape the yolks into a large wide bowl. 6. In a clean, grease-free bowl, with clean beaters, whip the egg whites on medium speed until frothy, about 1 minute. Add the lemon juice and beat on medium speed until the beaters leave traces in the whites and the whites form soft peaks when the beaters are raised. While beating on medium speed, add the reserved 1/3 cup sugar in 1-tablespoon installments, beating about 10 seconds between additions. Raise the speed to medium high and continue beating until the whites are thick and shiny—with a creamy texture like a marshmallow cream—and form firm peaks. 7. Fold about ¼ of the whites into the yolks to lighten them and fold in the remaining whites in two installments just until no whites show. Rinse the tube pan under running hot water and shake out excess water. Scrape the batter into the tube pan and spread level. Place the pan into the cold oven. 8. Turn on the oven to 325 degrees and bake about 45 to 50 minutes, until the cake has risen almost to the top of the pan, is golden brown, and springs back when gently pressed. Invert the cake pan onto your countertop suspended by its “feet.” Don’t worry, the cake won’t fall out of the pan while your back is turned. Cool completely upside down, about 3 hours. (Note: If your tube pan lacks feet, support the pan upside down on the neck of a bottle). 9. To remove cake from the pan, run a narrow blade around the edge of the cake to release, lift the cake out of the pan by its tube, run the knife around the central tube and between the cake and the bottom of the pan, and invert onto a cake plate. The cake will now be upside down. Lift away the bottom of the pan and the cake is ready to serve. Cut into portions with a serrated knife. The cake stays nice and moist for 2 to 3 days at room temperature if covered properly. 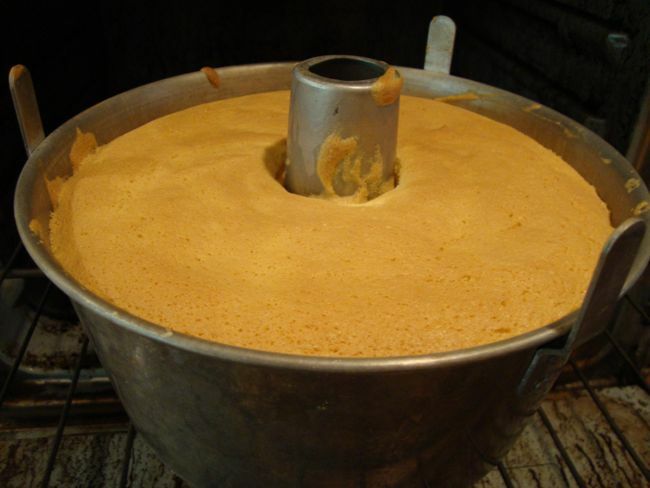 NOTE: To Make Granny’s Sponge Cake When it’s Not Passover: Increase the orange juice to 6 tablespoons and use 1 1/2 cups (5 1/4 ounces) sifted cake flour instead of the matzoh cake meal, potato, and tapioca starch. You must use cake flour. No substitutions! Sift the flour onto a large sheet of wax paper and spoon flour lightly into dry measuring cups to overflowing; sweep off excess with a straight edge without banging or shaking the measuring cups. If you have a scale, just weigh the flour. Beat it in right after incorporating the orange juice. 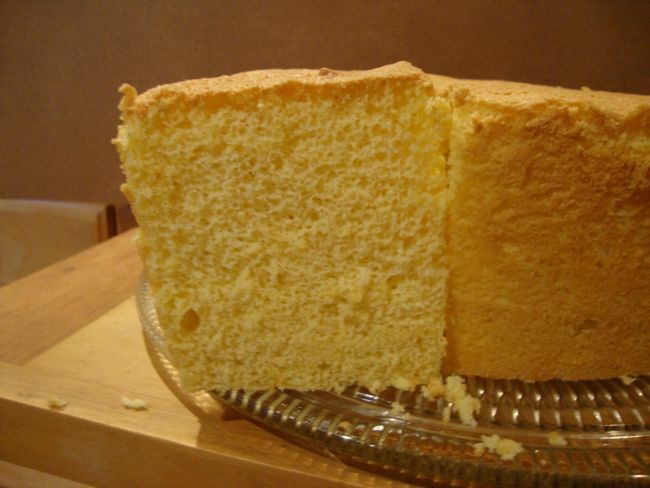 Here’s what Granny’s Citrus Passover Sponge Cake looks like when you cut into it. See how airy it is? Warmest regards to you and Dorothy. Wonderful to hear from you, Bipin. Hope you’re well, too. This brings back memories for me too, particularly the sponge cakes of your Aunty Molly in Vancouver. I’m sending this around to my Iraqi cousins. Lucky you to have tasted Aunt Molly’s sponge cakes. I’ll bet she learned how to cook and bake from Granny. And thanks for passing my version of Granny’s recipe around.